Last week we discussed the history of dining utensils, including an insightful review of the dubious origins of the fork. This week we will focus on the proper arrangement of different utensils, plates and cups and discuss why stuff is placed where it is. To begin, here are some helpful hints from Dylan Flosi at Abuso, one of the caterers that we use at our own events here at HMNS. For any event there is always the question of which table setting is most appropriate. 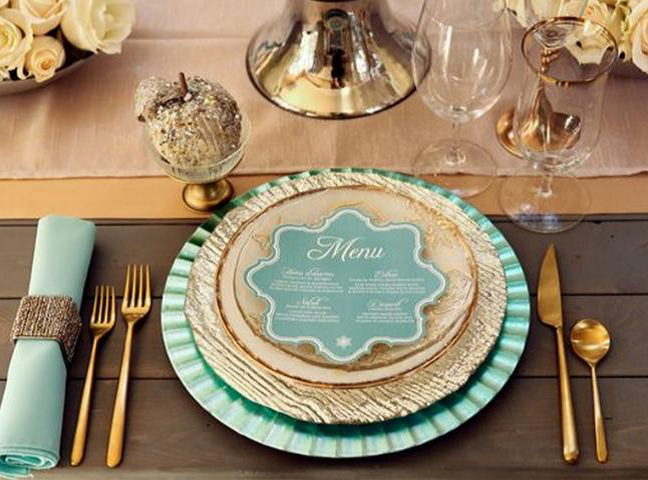 Choosing the right table setting is crucial, it determines how formal or informal your guests will feel. There are four types of table settings: formal, basic casual and buffet; today we will mainly focus on casual table setting. The difference between all four table settings is how many courses will be served and how it will be served. For any of these there is always one constant, the fork, spoon, and knife utensils as well as two glasses. 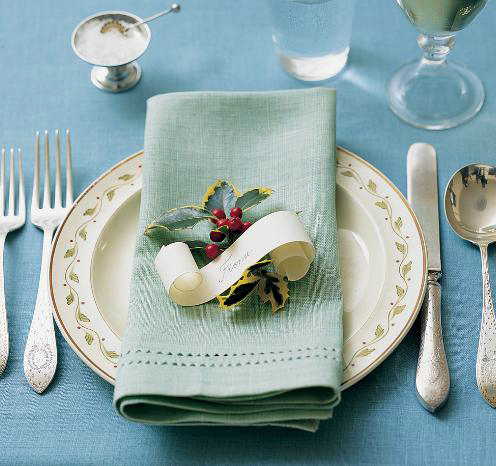 For any table setting, the forks are placed on the left side of the plate, the knife and spoon to the right and one water goblet to the left and one wine glass above the tip of the knife also on the left. The placement of each is dependent on the order of the course, for example, the formal table setting uses about 17 elements as there are more courses versus the casual table setting has 10 elements. The Casual table settings is the simplified option to provide more space for guests around the dinner table, bread and butter are also optional for this setting and can be placed above the forks on the left. For every occasion an appropriate table setting will be chosen to provide an optimal dining experience, keep all guests comfortable and you will make each any every event stylish, fitting and just right! 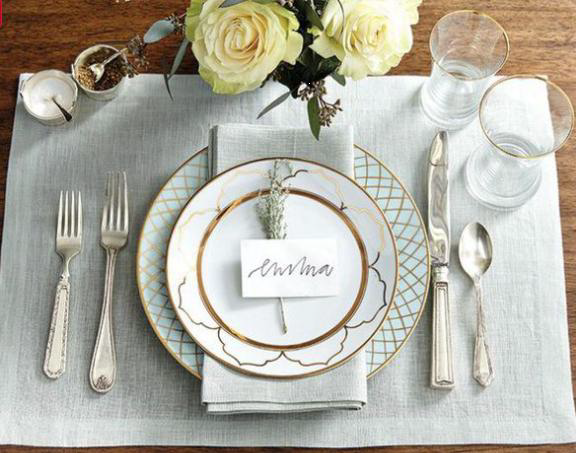 We have now covered the what and the where of table setting, so now it’s time for the why. Let’s start with why the fork is on the left side and why the knife and spoon are on the right. The answer is pretty simple, it’s all about which hand you will be holding the utensil with. Whether you use your fork and knife in the European or American tradition (this was discussed in the part I of this blog) you will be picking the fork up with your left hand first. The knife and spoon, on the other hand, are always going to be held by your right, dominant hand since both utensils require a little more dexterity. The setting of plates, glasses and cups reflects the same logic. Cups and glasses are generally on the right hand side, while plates for bread and dessert tend to be on the left. This ensures that a steady hand is holding any containers with liquids in them. I’ve seen some articles that say water goblets are supposed to go on the left side (shrugs shoulders) but even so drinking water from a cup requires less finesse than sipping from a wine glass or holding a mug, so the logic still holds up. 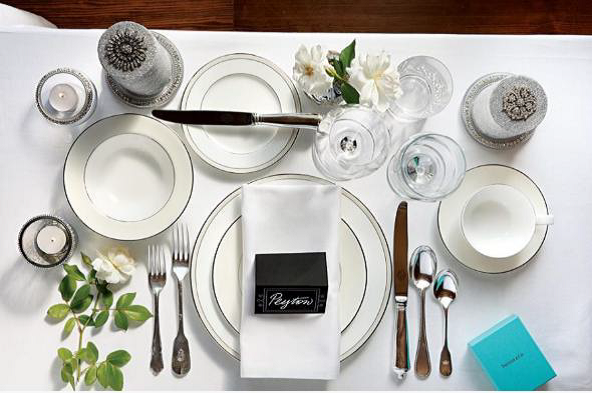 For formal dining arrangements, different types of forks may be utilized and these are generally placed in the order in which you will need them from right to left, which is pretty logical since it allows you to work toward your plate and get rid of dirty dessert and oyster forks without having to rearrange everything. Jean Fouquet, ”Les grandes chroniques de France”, Paris, ca 1460, Biblioteque Nationale, Département des manuscrits. Source: Wikimedia Commons. Interestingly, the number of plates and utensils you could expect to be in front of you has changed over the years. 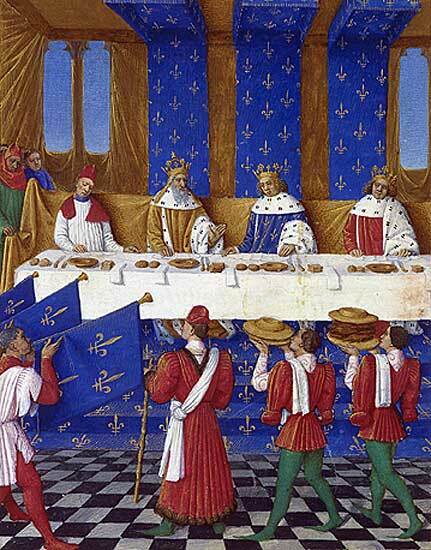 From the Medieval period up until the late-eighteenth century something called Service à la française was popular with wealthy hosts. Imagine the classic image of a medieval king’s feast and you will have something of an idea of what this type of dinner service looked like. This method had entire courses brought out and laid in the middle of the table. The goal of Service à la française was to allow the host to show off their wealth. The table would be completely filled with a wide assortment of dishes. There were usually three courses and every course would be as big as possible, open real estate on the table implied that the host couldn’t afford to fill it. The number of plates and utensils would be kept to a minimum. In fact, in the early days guests brought their own utensils. When a course was taken up, all the plates would be replaced and sometimes even the table cloth, which in those days also served as a giant napkin, would be replaced with a fresh, clean one. Our modern idea of fine dining began with what was called service à la russe. This style of service placed emphasis on quality and presentation of food rather than sheer volume. It was developed in Russia, but became popular throughout Europe in the mid-nineteenth century, replacing the French style of service. For those of you who despise the complex cuts of vegetables and meats that look like modern art, splashed over with blood splatter-esque dashes of sauce, that pass for dishes in some fine dining establishments, blame the Russians. It all started with them. 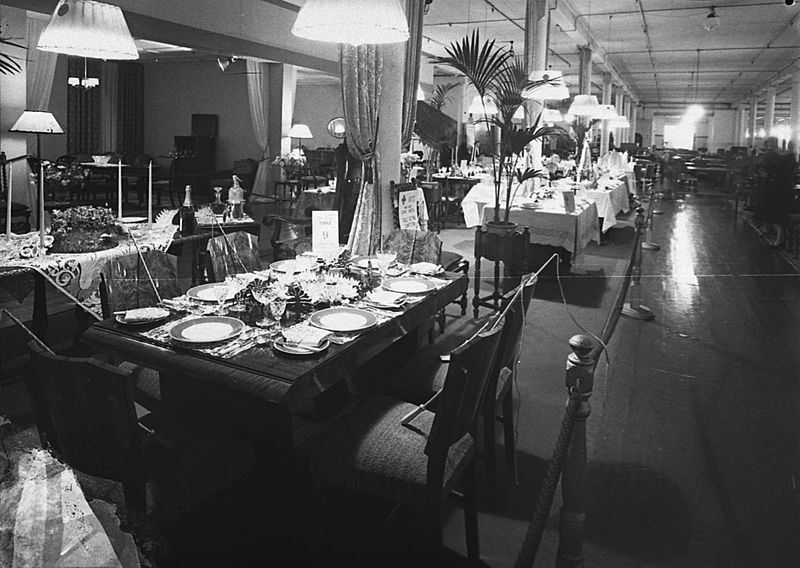 Table setting exhibition, September 1941. Source: Wikimedia Commons. Service in the Russian style is basically the sort of dinner service you see in Downton Abbey, individual plates are brought out, already cut and prepared, and served to the diners. Admittedly, this style of service is a lot more efficient than the French style, wherein huge amounts of food would be left out to get cold before all of the guest could get to it, but the catch is that it lead to the evolution of a heap of odd manners and etiquette revolving around the placement and use of plates and utensils, some of which are still in use to this day. With the table no longer crowded with food, a menagerie of plates and utensils could be laid out in preparation for the coming courses. Any extra real estate was taken up by decoration, centerpieces evolved into complex table arrangements. These days most people use an abbreviated version of service à la russe during their formal dinners. The concept of setting out utensils and dishes in an order based on how they will be used began with that style of dining. It is interesting that what we think of as a “traditional” table setting is only about two hundred years old and was originally only used in the homes of the very wealthy. Next Post Cockrell Butterfly Center Spring Plant Sale This Saturday!